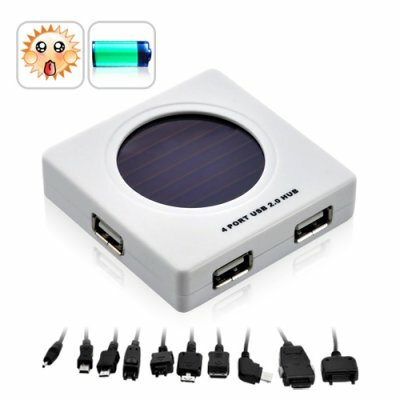 Successfully Added Solar Charger USB Hub to your Shopping Cart. More than just a standard 4-port USB 2.0 hub, this Solar Charger USB Hub is also an emergency green power reserve that will grant your portable electronic devices some more life. Portable, lightweight, and highly useful, this is the next "must-have" tech gadget! The four USB ports are fully compliant with the USB 2.0 specification and will work just as well with the older and slower 1.1 devices. Along with the plug and play feature (which eliminates the need for any drivers) and support for Windows, Mac, and Linux machines, you are granted true freedom with this Solar Charger USB Hub. Best of all, the small dimensions and lightweight construction will let it fit easily inside your pocket or netbook pouch, making it the perfect travel companion. When not connected to your computer and used as a USB hub, take this Solar Charger USB Hub with you and have it act as an emergency power supply! It comes with a built-in lithium battery that can be charged with an AC adapter or by exposing the solar panel to any light source, allowing you to give your electronic devices an extra boost of power. This Solar Charger USB Hub includes 10 adapters that will charge almost any portable device on the go, including MP3 players, handheld game consoles (PSP, NDS), major PDA/phone brands (Blackberry, Nokia, Motorola, HTC, LG, Samsung, Sony Ericsson, and of course, most Chinese brand phones). If you need that one emergency power supply for all of your devices, this amazing tech gadget is it! With the lowest ever price tag of $15, this Solar Charger USB Hub is a must-have gadget, no matter if you're getting one for yourself buying one for your gadget-loving friends. Available in our warehouse now, click "Add to Cart" right now and we'll express ship it out to you tomorrow - guaranteed! Brought to you by the leader in Wholesale Electronics - Chinavasion. Use sunlight to charge your mobile phones, PDAs, MP3 player, MP4 players, etc. Note: Included cables are for power only and will not provide a data connection. Please use the cable that comes with your product if you want both power/data. How come I can't get a data connection? You must use the product's own USB cable. The connectors that are included are for power recharging only. What products can I recharge with this? Any that can be charged by USB! 10 connector cables are included to recharge most mobile phone brands and electronic devices, but use your own USB cable with your device and you can charge almost anything!